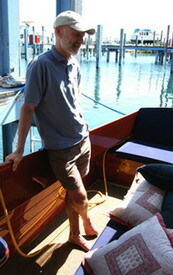 This summer of 2008 has gone very fast and it has been a fantastic time teaching Advanced Yacht Joinery at the Great Lake Boatbuilding School www.greatlakesboatbuilding.org. 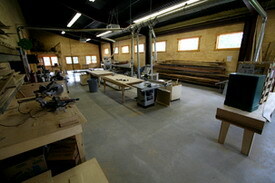 The school which is located in upper Michigan is a 12,000 square foot new building constructed just for teaching boatbuilding and is located on the shores of Lake Huron. Cedarville, the town were the school is, has a small population especially over the winter but it comes alive in the summer with people coming from the surrounding areas to escape the heat and enjoy the beautiful lakes and wild life. 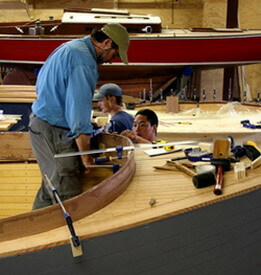 The class is the first YJ program the school has run and it has received great interest as there is a need for people in this side of the boatbuilding industry. There were 4 students who came from the Boatbuilding program and all are planing to continue working in some part of the boatbuilding trade. 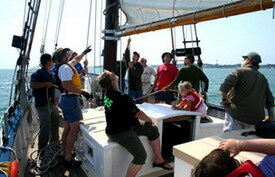 I will be home Sept 1st just in time to head down the Port Townsend Wooden boat Festival. 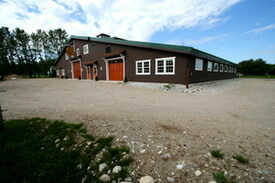 12,000 feet of new building just for teaching boatbuilding. 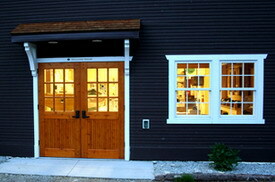 The big doors lead to the large shop, the next smaller door is the finishing shop and windows in the fore ground are the class room and library area. 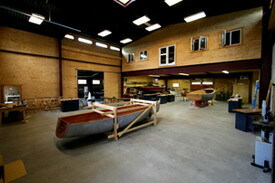 The open shop floor has lots of room for students and boats; the upper room is for lofting the boats. The Machinery room as all a tools you need, with a few extras like the Saw Stop a table saw we call the wiener saw because if you touch the saw while it’s running it will abruptly stop and the company demonstrates this by trying to run a wiener into the blade. 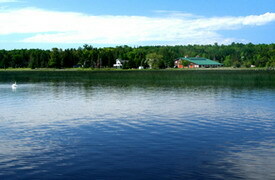 Looking back from the shores of Cedarville over Lake Heron is the Boat School. 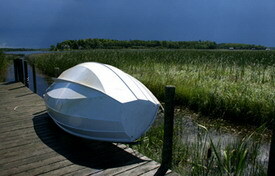 Much of the shore front is marsh and loaded with birds and wild life. In the near future the docks in front of the school will be expanded to give more room for the schools boats. 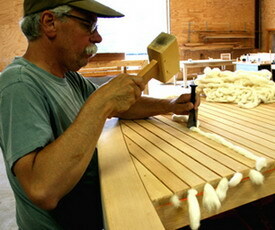 An 18 ft Concordia Sloop is being restored, sits just behind the doors of the school. 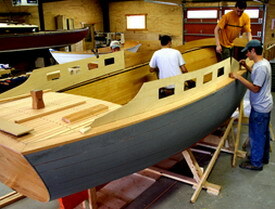 One of the schools boatbuilding projects was building this 21 ft utility launch designed by Nelson Zimmer. 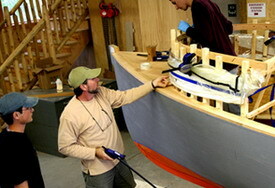 During the Yacht Joinery program we worked on fitting her out, here the students are mocking up the house and combing. More mocking up and taking patterns for the bulkheads. After building a mold on the boat for the forward curved combing we then laminated Sapele mahogany veneer in a vacuum bag to let then set over night into there new shape. 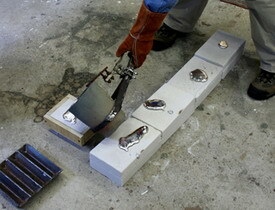 The students and I are dry fitting the new combing to the Utility Launch. 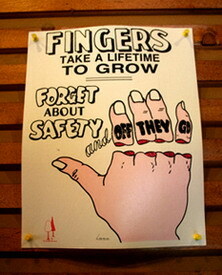 While touring one of the local saw mill we came across the great sign for safety. 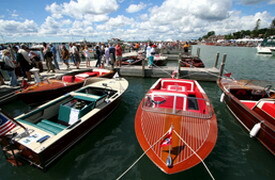 Hessel is the next town over from Cedarville about a ten minute drive; there they had the 2008 Hessel Antique Boat show, with more mahogany boats than I have seen in my life. Patrick Mahon the schools head instructor caulking the motor launches deck. Students setting up a level and reference line for building the cabin sole beams. 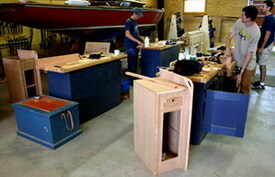 An example of ships furniture built in the Yacht Joinery class; each student builds the same locker that they can take home. 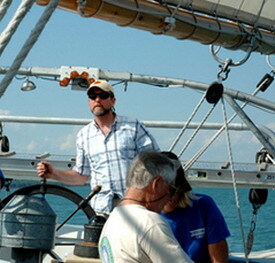 Steve Van Dam a boat builder in Michigan, his company builds exquisite high end boats, is generously giving his time to talk to the students about the does and don’ts of the boatbuilding industry. Dan Fields gave the students a one day work shop on casting, here we are poring the molten aluminium into moulds the students made. 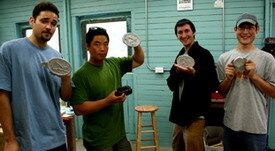 Each student learned how the cast and built a plaque. Students from left to right Chris, Yong, Josh, and Bob On the dock at the school just after a thunder storm came through.